Travel to the Past to Save the Present! Restore forgotten lands and battle an unknown evil in this classic DRAGON QUEST® adventure completely rebuilt from the ground up for the Nintendo 3DS™ system. Customize your party with over 30 vocations and level up in turn-based battles to learn new spells and abilities in this timeless quest! 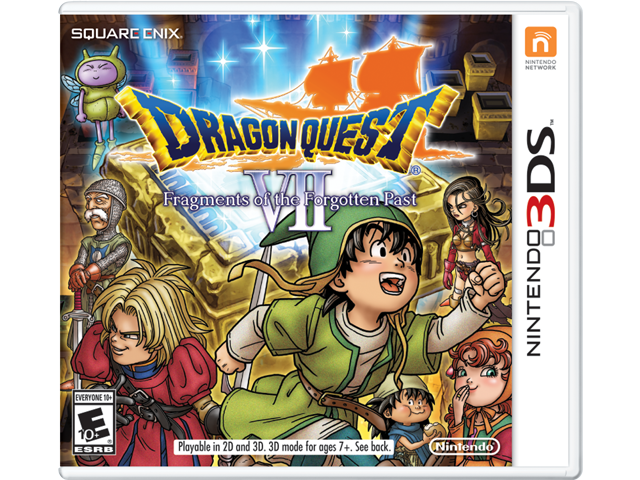 Featuring character and monster designs from acclaimed artist Akira Toriyama, in the Dragon Quest VII game, you'll explore an ever-changing world filled with mystery, intrigue, and danger. On your quest you'll meet a captivating cast of characters that will help you change time as you solve their problems and save their lives. Expand and share your adventure even more with the StreetPass™ feature—send and receive traveler's tablets to explore new dungeons that contain rare monsters and unique equipment.